It may take investigators “many months” to work out exactly what happened to Sergei Skripal, the Metropolitan Police have said. It is one of the biggest and most complex case counter-terrorism officers in the UK have ever worked on. The former Russian spy and his daughter remain critically ill in hospital after being attacked with nerve agent. 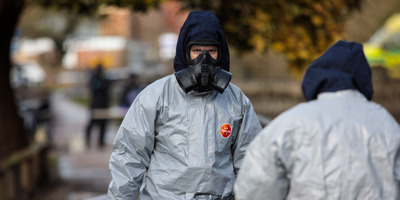 Police have warned that the investigation into the poisoning of Sergei Skripal will not be over quickly, saying it may take “many months” before they work out what exactly happened in the nerve gas attack in Salisbury, England. In a statement published on Monday evening, the Metropolitan Police said the investigation is “one of the largest and most complex undertaken by British counter terrorism policing,” and that around 250 detectives are working on the case. Officers are looking through more than 4,000 hours of CCTV footage, are examining nearly 800 exhibits, and have taken around 400 witness statements. British authorities have said that Skripal, a former Russian spy living in England, was poisoned with a Soviet-era military-grade nerve agent called Novichok, and that the Russian government was likely responsible. (Russia has repeatedly denied any involvement.) But beyond that, many details remain murky. It’s not clear how the poisoned was administered to Skripal, though one theory is that it was hidden in the suitcase of his 33-year-old daughter Yulia, who has also been poisoned – meaning the would-be assassin may never have left Russia. Another theory that has circulated in recent days is that the substance was smeared on the handle of Sergei Skripal’s car, poisoning him when he touched it. Multiple sites in Salisbury have been cordoned off by investigators, including a Zizzi restaurant and the Mill pub that the Skripals visited on the day they collapsed, as has a ticket dispenser at a Sainsbury’s supermarket car park. Sergei and Yulia Skripal remain critically ill in hospital. On Thursday, Britain’s allies rallied round it, issuing a joint statement with the US, France, and Germany blaming Russia for the attack. Britain has expelled 23 Russian diplomats as relations between the two country sink to what may be their lowest since the end of the Cold War, and Russia has retaliated in kind. Russia’s Ministry of Defence responded by calling him a “vulgar old harpy” and insulting his intelligence.